A new study from Statistics Canada shows just how wealthy we are as a nation, but it also highlights how many Canadians are heavily in debt or poor. 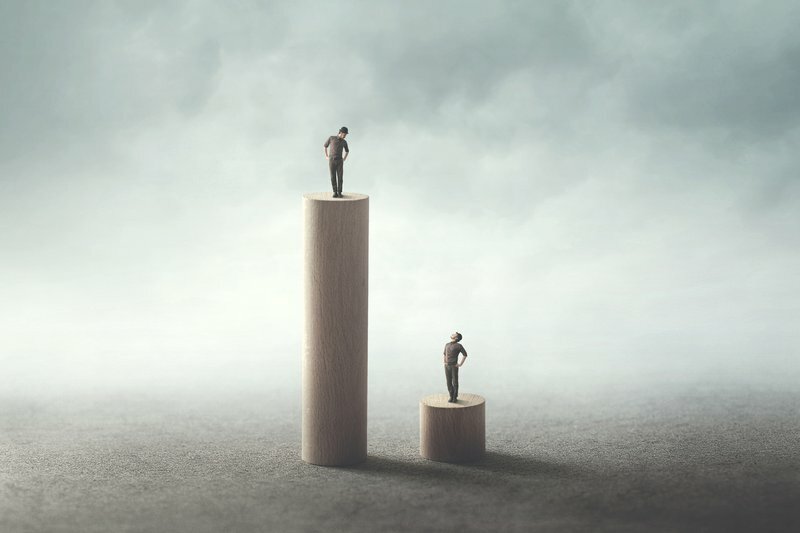 The report by principal researcher Guy Gellatly and senior research economist Elizabeth Richards, released this week, comes amid the continuing controversy over income inequality in Canada and is certain to feed into the debate. Their study illustrates how wealth has increased markedly, and how debt-to-income levels in Victoria, Vancouver and Toronto are out of whack with the rest of Canada. And, notably, how 8.4 per cent of families have less than $500 in net worth. Some of the numbers may be a bit out of date, given that they’re taken largely from a 2016 Survey of Financial Security, and, of course, given the change in borrowing habits since interest rates first rose and new mortgage-qualification stress tests came into effect early last year. But the researchers also took information from other Statistics Canada sources to include the “most up-to-date results,” Ms. Richards said. The numbers shed light on debt and wealth across Canadian regions and income groups, and show changes over time. And, remember, although our borrowing habits may have cooled along with housing markets, credit levels remain swollen, and the household debt burden elevated. “Debt-to-income levels among Canadian households continued to edge higher in the years following the recession, before rising sharply in 2015 and 2016 when income growth slowed as the economy adjusted to lower oil prices,” Mr. Gellatly and Ms. Richards said. 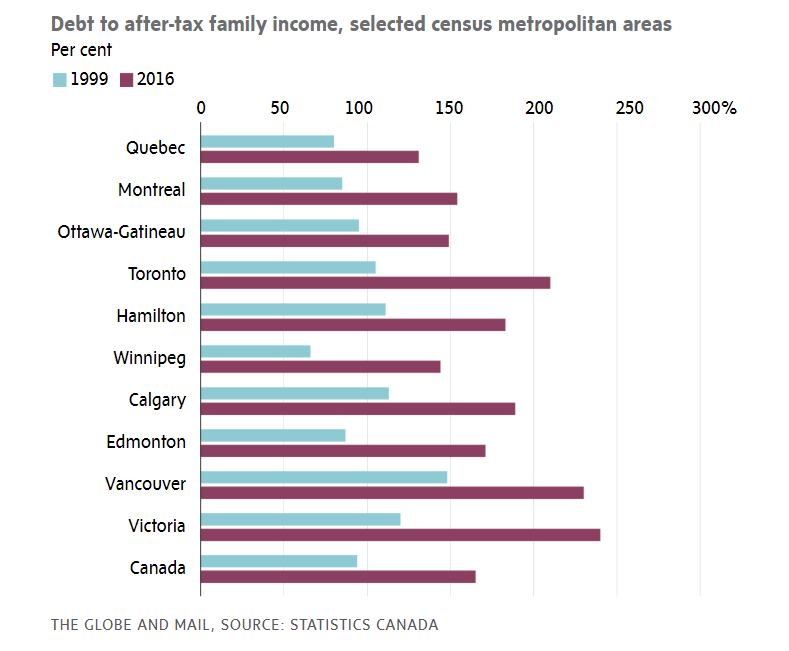 The debt-to-income ratios of households in Victoria, Vancouver and Toronto stood at 240 per cent, 230 per cent and 210 per cent, respectively, in 2016, topping the national average of 165 per cent. For purposes of comparison, those in Moncton, London and Fredericton, at 106 per cent, 113 per cent and 119 per cent, trailed the average. Mortgages are, of course, a big part of overall debt, rising to 80.7 per cent of the total in 2016 from 77.4 per cent in 1999. “The leverage and wealth estimates reported above highlight the extent to which many lower-income families carry on average both higher debt loads and lower levels of net wealth,” the Statistics Canada researchers said. Households in the lowest income quintiles in Toronto had a sharp 420 per cent of debt as a proportion of income. In Vancouver, that stood at 400 per cent. Thus, the study underscores how “it was the poorest households in the nation’s two largest cities that were squeezed the most,” said Bank of Montreal economic analyst Priscilla Thiagamoorthy. “We suspect the bulk of the debt was likely from student assistance programs, auto loans and credit cards,” she said. The latest numbers from Statistics Canada, for the record, showed household credit market debt-to-disposable income at a seasonally adjusted 178.5 per cent in the fourth quarter, which means we owe $1.79 for each dollar of disposable income. 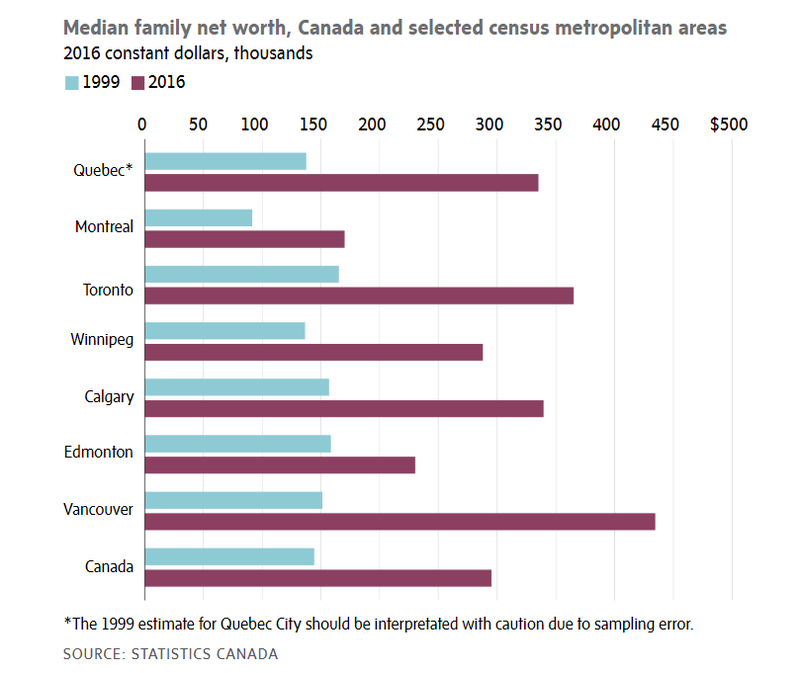 Median net worth surged to $295,000 in 2016 from $144,500 in 1999, driven by families in Toronto and Vancouver, where such net worth rose 121 per cent to $365,100 and 188 per cent to $434,400, respectively. “Despite significantly higher debt levels, those at the lowest end of the income distribution also generally had lower net worth, particularly compared with those in the higher income quintiles,” Statistics Canada said. Breaking it down, families in every income quintile chalked up gains in net worth as the values of their assets rose faster than their liabilities. Average wealth per family in the bottom quintile rose 88 per cent between 2010 and 2017, to $213,800 from $124,100. Those at the bottom accounted for 5.8 per cent of wealth in the country, up from 4.9 per cent. And, as they say, the rich got richer, with net worth in the top quintile surging 56 per cent to $1.8-million in 2017 from $1.3-million in 2010. Their share of the wealth actually dipped to 49 per cent from 50.3 per cent. “Families living in British Columbia and Ontario exhibit higher median wealth than those living in other provinces,” said Mr. Gellatly and Ms. Richards. “The contribution of housing to real asset growth is more pronounced in Toronto and Vancouver. In these cities, principal residences accounted for over 50 per cent of real asset growth during this period,” they added. 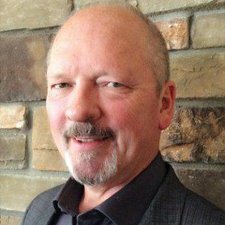 Separately, investment firm Edward Jones this week released survey results that showed 77 per cent of Canada think saving is more important than paying down their debts, at 44 per cent.